Bengaluru, Karnataka (India) -- Traditional medical systems, like Ayurveda, Siddha or Unani, are known for their wholesome and natural systems. And then there is Tibetan medicine that brings together natural elements along with a prescribed set of rules in Astrology. Tibetan medicine, that was laid down by the hard-working and enduring people of the ‘roof of the world’, started off as little tips for survival and gradually came to encompass the many natural healing processes from surrounding countries and also the spirituality that Buddhism professes. The Tibetans discovered several basic medical remedies, such as the application of melted butter to stop bleeding or hot water for indigestion, that helped them combat the severe and harsh environs that they inhabited. When the senior Yuthok Yonten Gonpo, the Medicine Buddha himself, composed the first version of the Gyueshi (the fundamental text of Tibetan medicine), it was based on the indigenous medical system with the synthesis of the medical systems from neighbouring countries. 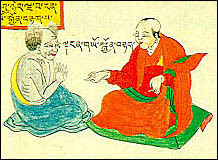 Today, various practices, research and pharmaceutical formulations of Tibetan medicine are based on the Gyueshi. According to Tibetan medicine, mind and body are often disturbed by the improper functioning of the three bio-energies — Loong, Tripa and Baekan. The Tibetan medical system is understood in Buddhist philosophy and the body is seen in relation to the mind. The body and mind cannot be treated in isolation and a learned Tibetan physician clearly identifies causes and conditions of disorders through the diagnostic methods of visual assessment, examination through touch and interrogation. When even the best of medication is prescribed to the patient but no recovery occurs, an assessment of the patient’s past and present karmic actions is undertaken. For this precise reason, the Gyueshi lays down that a Tibetan physician must possess the qualities of intelligence, compassion, commitment, dexterity, diligence and morality. Today, Tibetan physicians are trained at The Men-Tsee-Khang (Tibetan Medical and Astrological Institute), Dharamsala, with a requirement to not just master the medical treatises but also have a well-rounded understanding of astrology and the planetary influences on sentient beings. Tibetan medicine recognises a life force that continuously travels within all of us. Even when the best medicines do not help in healing, it is believed that the life force is disturbed. Hence, an evaluation of a patient’s past and present karmic actions is undertaken and the root of the ailment is found in the patient’s karma. According to Tibetan belief, the movements of the plate constantly dictate our actions on Earth. And, the planetary movements affect the five elements that constitute us. Hence, according to the current positions of the planets the patient is advised on various daily actions, including bathing and eating. Himalayan herbs, that are the core ingredients of Tibetan medicines, are also picked according to the position of the planets to ensure efficacy. Tibetan medicine practitioners also study the movement of the life force energy or prana to understand the patient’s ailment. We gauge how the life force energy travels and where it’s going to be and accordingly prescribe medicines or consider external procedures to restore the balance within a patient. Healing in Tibetan medicine begins from within with an understanding and acceptance of the disease that must come from the patient itself. The first step is to accept the disease and the practitioner’s purpose is to ‘purify’ and transform the patient into a new being from within and without. However, no healing can occur if the patient has no faith in the system. Healing is a part of faith. When the mind is blocked, healing cannot occur. This is why the patient must believe in the practitioner and the practice. Today, practitioners of Tibetan medicine are looking to promote and practise gowa-rigpa, the Tibetan system of medicine, astronomy and astrology, globally. One of its salient beliefs is also to provide accessible health care to people regardless of caste, colour or creed. The Tibetan medicine system also has to be one of the greenest practices of our lifetime, as all clinical research and drug production is carried out at Men-Tsee-Khang in the most environmentally sensitive manner.